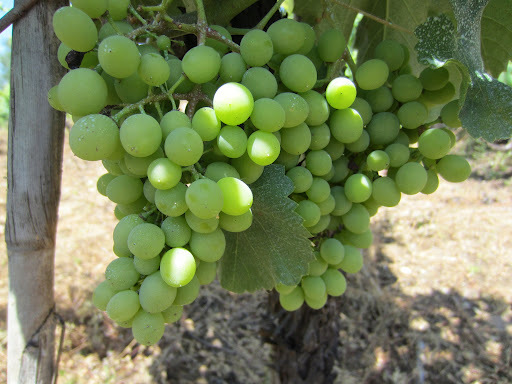 There are a small number of grape varieties can be set apart from all others. Their defining characteristic is that they can only be grown in a few specific parts of the world, and can only be made well in the best places by people who truly respect the partnership between the vine and the environment. Another of their defining characteristics is that they are the few that should always be made as mono-varietal still wines, and are also hugely influenced by the viticulturalists and winemakers who work with them. For white wines there is really only two in my humble opinion – riesling and chardonnay – although the latter is one of the most planted white varieties in the world. In terms of red wine there is a select group with a few knocking on the door. The outsiders are syrah, sangiovese and tempranillo, whilst the insiders are pinot noir and nebbiolo. There is one Portuguese variety that has been spoken about as joining this elite few, and that variety is baga. I agree that the variety has the potential to have the same silky tannins, delicate yet firm structure, and brightness of fruit that characterises the other two, but I need to taste more before I am certain it isn’t an also-run. I also believe the winemakers here need to get more experience, as they have only been making premium wines from this variety quite recently. The third winery I visited in Bairrada also happened to be another Baga friend, located just down the road from Luis Pato. Quinta das Bageiras is about as traditional as they come, in a pretty wild kind of way. 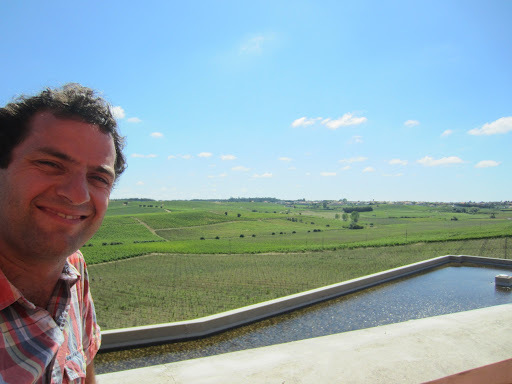 Mario Sergio Alves Nuno wanted to continue his family’s tradition of premium grape production in the small plots they owned, but like other modern pioneers in Portugal was determined to show the true potential of the region. In 1989 he bottled his first vintage for commercial sale, and he still has some of these bottles. Like many others in the region the majority of the production is dedicated to traditional method sparkling wine, as there is a lot of demand for these wines from Bairrada all over Europe. In fact whilst I was visiting the importer from Belgium was desperately trying to secure two palettes of sparkling wine, with another two by the end of the year. Mario’s passion is in the still wines, particularly baga which he makes in a very simple way. His philosophy is that the quality of a wine is made in the vineyard, and that the job of the winemaker is to very gently extract the essence in the winery. There are some very old vines out in his 12 hectares, both red and white, and the natural yields give the fruit excellent concentration and personality. The fruit for the red wines is harvested by hand and transported to the winery, where it goes into the shallow and wide cement lagares. The fruit is crushed by foot and left to ferment and macerate, the skins being plunged at least once a day using old plunging paddles. 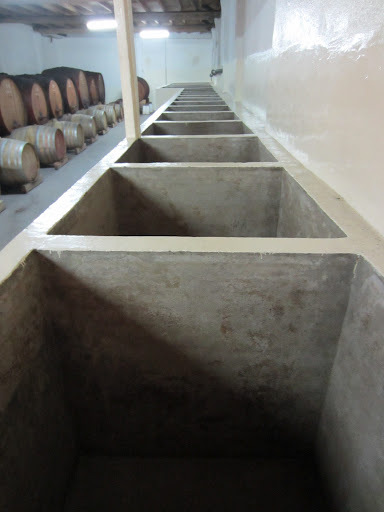 The fermentation is completely spontaneous which helps complete the fermentation to dryness and also protect the wine from a lot of oxidation. After pressing the wines go into old French oak barrels for ageing which is rarely more than 12 months, before it goes into bottles where the real ageing begins. The wines don’t see any fining and only go through natural filtrations, and the only point that the red wines see any sulfites is at bottling. For the white wines the grapes go directly into smaller open lagares where they are gently pressed under sulphites to protect them from oxidation and prevent fermentation, before they are pumped to stainless steel tanks or very old barrels to be fermented. The focus on the viticulture and the minimal and respectful winemaking makes the wines very elegant and structured, with simply stunning texture rather than obvious flavours. I had a wonderful time discussing Portuguese wine and different philosophies during the visit and then over lunch at probably the best restaurant in all of Bairrada, where I was virtually stuffed with seafood by the chef. Click here to see my notes on the tasting at Quinta das Bageiras. The winery I visited in the afternoon was an excellent example of the modern wine businesses in Portugal, where I met with Carlos Campolargo at his modern facility. Like most Carlos’ family had a history in viticulture but he himself is a lawyer by trade with a passion for great wine. 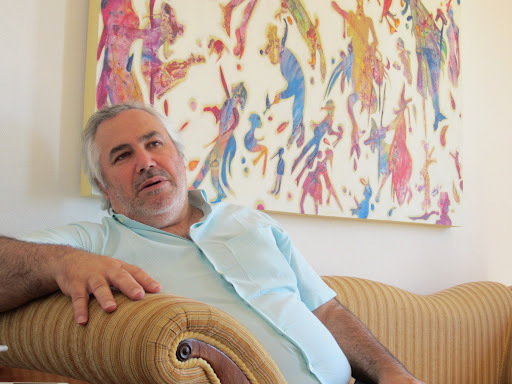 He made the decision to grow in the wine business back in the early 1990s when the wine boom was really taking off but it was still relatively cheap to invest in land and infrastructure. It was his forefathers who made the bold decision to plant a wide range of varieties both indigenous and introduced, to really explore the potential of the terroir and to discover how it could be translated through different grapes. This approach in my opinion is very new world and is quite progressive, showing a real sense of experimentation and flying in the face of public opinion and inherited traditions. Campolargo has some of the largest vineyard holdings in the region with 170 hectares, meaning there are lots of little micro-climates and pockets of land that can express differently through the wine. The vineyards are mostly in a north-facing exposition which in Carlos’ opinion is better for a slower ripening through the summer, particularly important for some of the more robust varieties. A new winery was completed a few years ago that has had a lot of thought put into it, and reminded me of some of the wineries I saw in Spain and South America. The entire winery has been built into the side of the hill and utilises gravity flow, so no pumping is necessary at any stage of the vinification. Sorting tables are used for the grapes before they go straight into shallow stainless steel tanks for the fermentation. 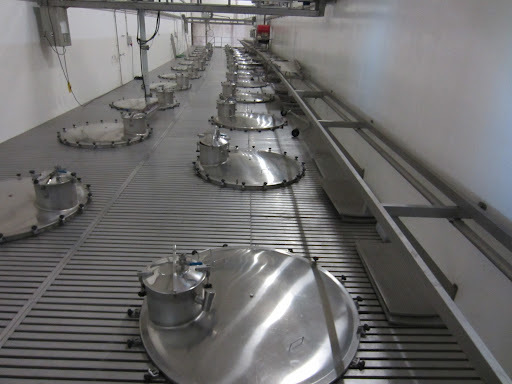 A specially designed automatic plunger was designed for the winery that could travel along a track to each of the tanks, and the hopper that puts the grapes into the tanks is similarly on a track that can be moved to the tanks. 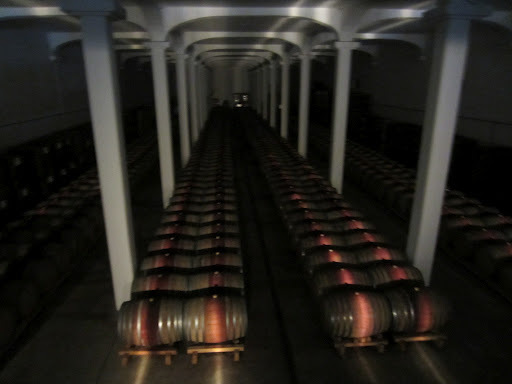 French barriques are used in varying ages for the maturation of the red wines, and in some cases the white wines too. A couple of the white varieties are fermented in old oak barrels, and Carlos is also experimenting with a chestnut barrel for one of his white wines. Carlos is a partner in a mobile bottling line company, which is ideal because he doesn’t have to have a bottling line idle in the winery and he can use it as and when he needs it. He has a very modern and proactive approach to wine, involving everything from production, to packaging, to communication, and he is ably assisted by a team that includes his daughter Joana. He is currently in a conundrum whether or to continue making wine from part of his vineyards and selling the rest of the fruit, or whether to increase production to account for all of the vineyards. The winery can certainly handle it, but the question is does he want the extra stress. The wines are excellent export quality, and there is enough in the extensive range (33 wines) to suit any customer in any market. Click here to read my notes on the tasting in the loft tasting room of Campolargo. Click here to see some more photos from my second day in Bairrada, Portugal. In evening I drove up to the Dao region to discover the touriga nacional grape.